Where is my Manage Invitation page? You can easily find the Manage Invitation page from your My Invitation Dashboard. Locate the invitation to find the Manage Invitation button. 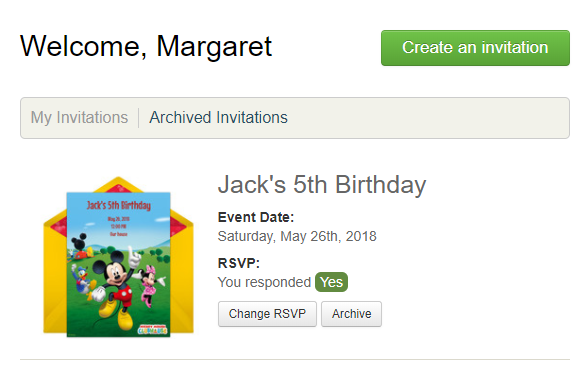 Do you see your invitation but instead see Continue your invitation button? Before you can access the Manage Invitation page you will need at least one guest on your guest list. Once you have sent invitations, the Continue your invitation will change to Manage Invitation. This indicates that the invitation has actually been created in a different account. Try logging in with a different email address or send us an email with the name of the event and we'll help you locate your invitation. If you're using the Punchbowl app, simply tap on the My Invites tab and then you can tap the image of the invitation to manage your invitation.